Google used to be the only way to figure out a Salesforce-related problem. You’d have to Google a keyword and then comb through the results, with links to Salesforce documentation and websites like StackExchange. But the times are changing, and there’s a relatively new Salesforce learning platform that provides a more hands-on approach: Trailhead. Don’t get me wrong, Google and all that documentation are still handy tools, but Trailhead goes a step further. Now you can actually put what you learn into practice. If you’re interested in mastering the fundamentals of Salesforce, keep reading for the lowdown on Trailhead. Each trail has a series of modules and projects designed to help you get background on a feature and practice the basics. Salesforce expertise levels differ, and Trailhead has a path for each one. That means this Salesforce learning platform caters to the needs of every user, from beginner to expert level. Trails start off by stating the objectives of the lesson–the main things you should be able to do after reading and completing the challenge. Then, it goes more in depth about the feature itself. Occasionally, you may be guided through a test run of the feature, in which the steps are written out for you, with pictures embedded in between. The estimated time that it should take to finish the challenge is always visible in the top right corner. This is a handy feature that enables you to budget your time–Trailhead can be addicting. After going through the material, you are either asked a series of multiple choice questions or asked to complete a challenge to demonstrate that you learned the covered material. In order to complete said challenges, you must have a new developer org. Signing into your Salesforce developer org allows you to complete the challenges in a real environment. These are graded, so pay attention! Also within your developer org, projects allows you to be guided step-by-step to gain new skills and practice using various Salesforce features. When you’re done, you hit the green “verify” button at the bottom of the page to have Salesforce check your work. If you skipped a step or zoned out during one of the videos and forgot to do something, Salesforce will prompt you to make further changes until the problem is resolved and you have successfully completed the task. 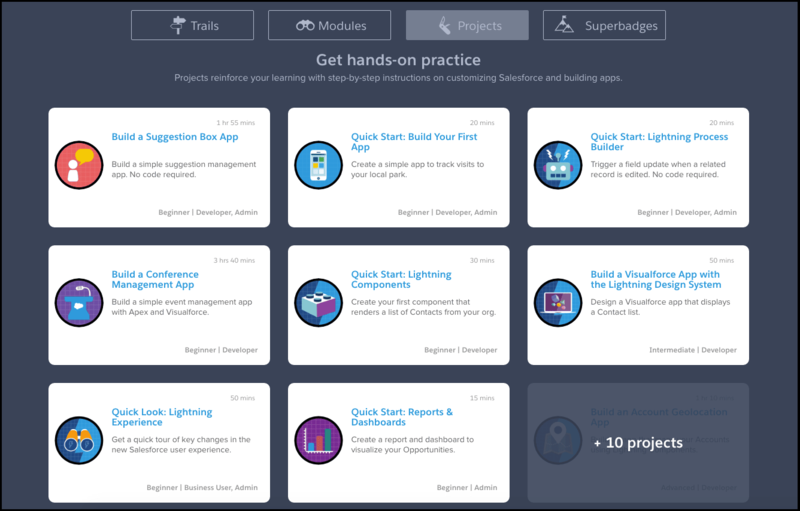 You can get hands-on practice by tackling targeted projects like these in Trailhead. 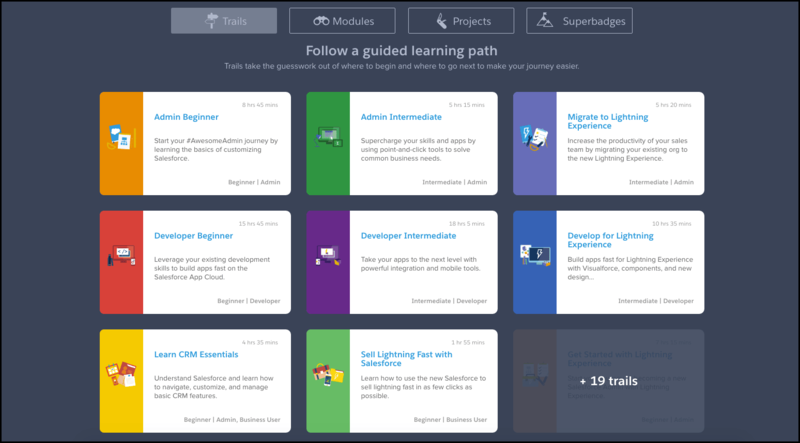 Basically a trail on steroids, SuperBadges upgrades you from basic to complex with challenges that have real-world requirements. Salesforce tells you everything you need to know–concepts tested, what you’ll be working with, and the main things that must get done. With SuperBadges, you work more on your Salesforce problem-solving skills, because now you must read the use case, or backstory, of a real problem and work to resolve it. Now you’re relying on the skills you learned from the various trails and taking it several steps further. These scenarios provide a great opportunity to think through what steps may need to be taken when you’re actually faced with a similar problem in a work environment. Trailhead SuperBadges challenge your problem-solving skills with real-life scenarios. One of the things I most appreciate about Trailhead is that it shows different ways to attack a problem. Oftentimes, it will give you insight on troubleshooting ideas that you never would have thought of on your own! You also have the freedom to revisit a trail for a refresh on a specific feature. To hear more about Trailhead from others at Red Argyle, check out this recent blog post from Adam or this one from Tamara. And if you have questions or want to share your own recent experiences with the Salesforce learning platform, reach out to us on Twitter: @redargyledotcom.